Are you an aspiring musician and/or singer and looking for a platform to showcase your talent? I know how frustrating it is for talented musicians who are new on the scene and struggling to get an audience to experience their talents. For “untested” musicians, the market is rather ruthless – nobody is really interested to engage musicians with no “proven track record” in the business. Well, then you’ll be glad to know that Unplugged Music Cafe in Subang Jaya may just be the platform to launch your talents. 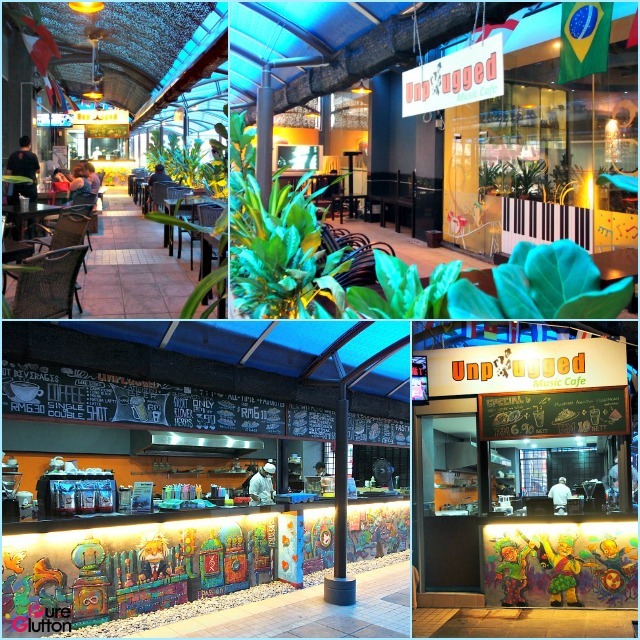 Located in the commercial centre of Subang Jaya, this unique cafe is conceived by two brothers with a desire to bring great music and good food to everyone. It all started because the Leong brothers wanted a nice place for people to chillout and relax in a comfortable al fresco setting while listening to some young and upcoming musicians/singers. 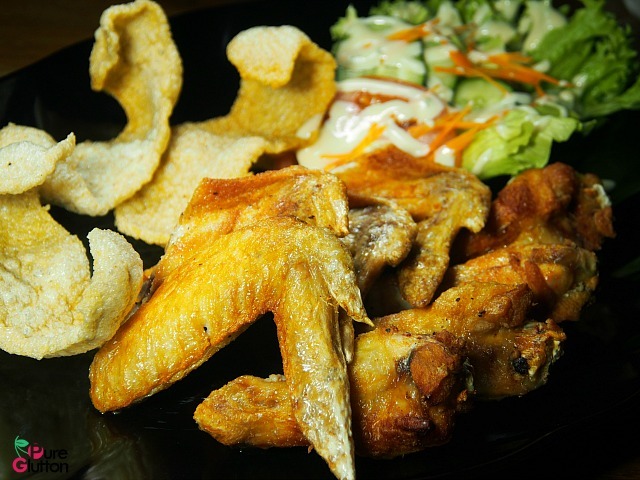 As mundane as it may sound, my favourite was their Deep-fried Chicken Wings (RM13.80) – nothing fancy there but the wings were well-marinated and fried to a crispy finish. That’s all that’s required for some good wings and these would go well with just about any drink you order! 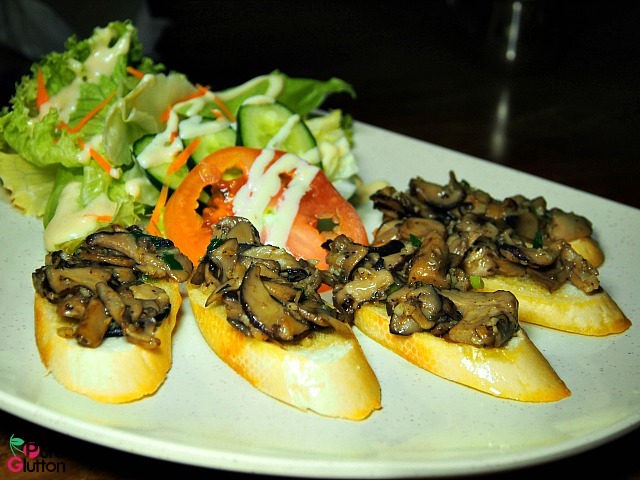 The Garlic Mushroom Bruschetta (RM11.80) came with clean easy flavours – just heaps of saute’ed mushrooms piled on top of toasted baguette slices. 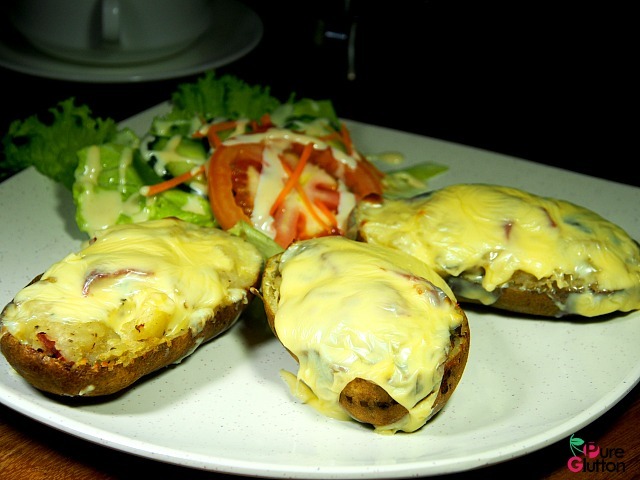 Lotus Potatoes (RM9) – baked Russet potatoes topped with minced beef and a layer of golden melty cheese. Fuss-free and easy to eat – kids would love these, I’m sure. I thought the Creamy Truffle Mushroom Soup at RM7 was a steal, don’t you think?! And it’s not something that came out of a can. 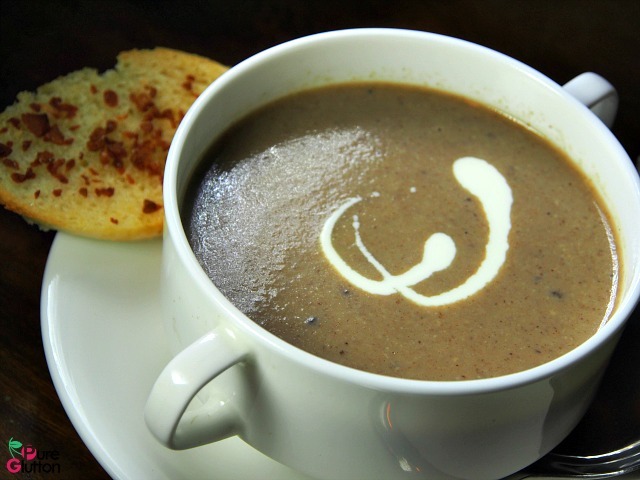 The thick creamy soup was very fragrant, thanks to the blended fresh mushrooms and dash of truffle oil in it. 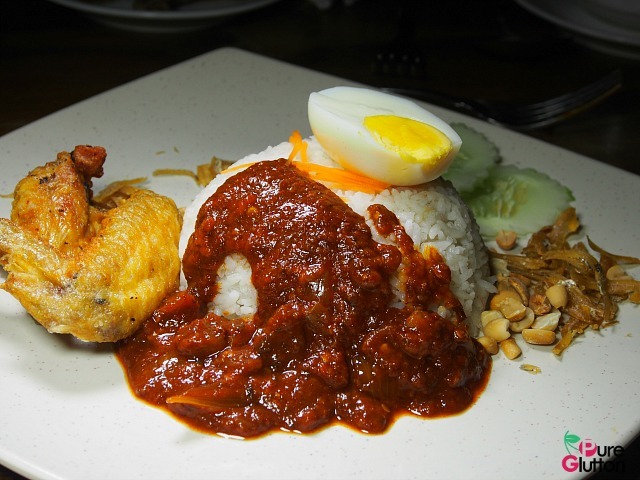 For those of you who can’t do without rice, their Nasi Lemak & Chicken Wing at RM6.90 is a pretty good deal. 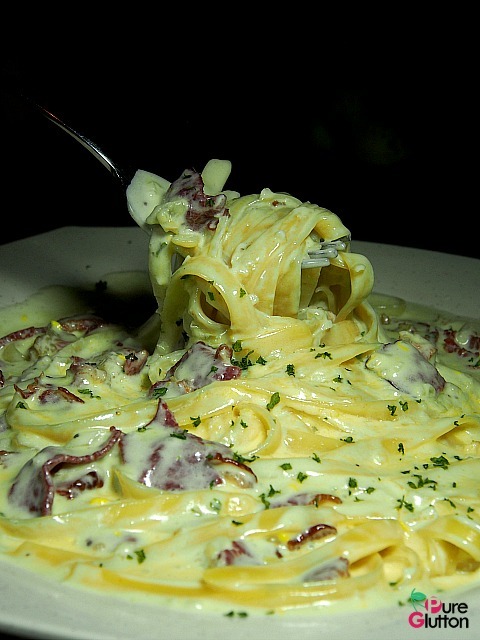 Pasta lovers will be glad to know that there are several choices on the menu. 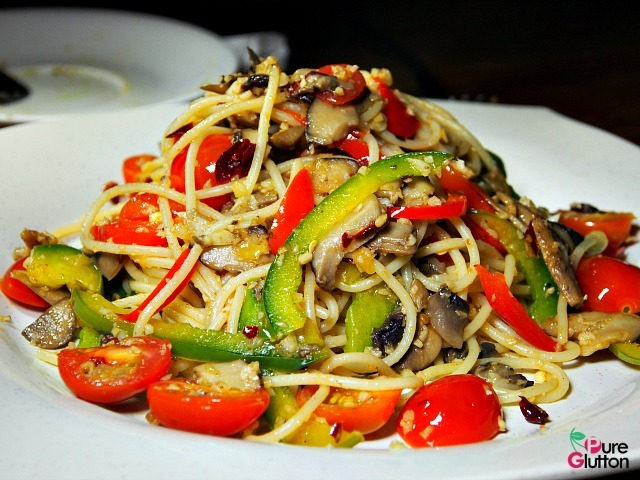 Between the Pasta Carbonara and Pasta Aglio Olio Mushroom (both at RM16.80), I preferred the latter for the good amount of sweet mushrooms and crunchy vegetables tossed in it! 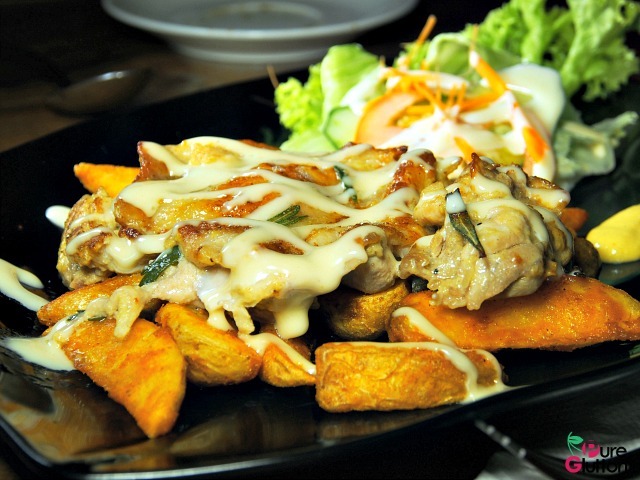 I was told that their signature dish, Honey Mustard Chicken (RM17.80) was immensely popular. 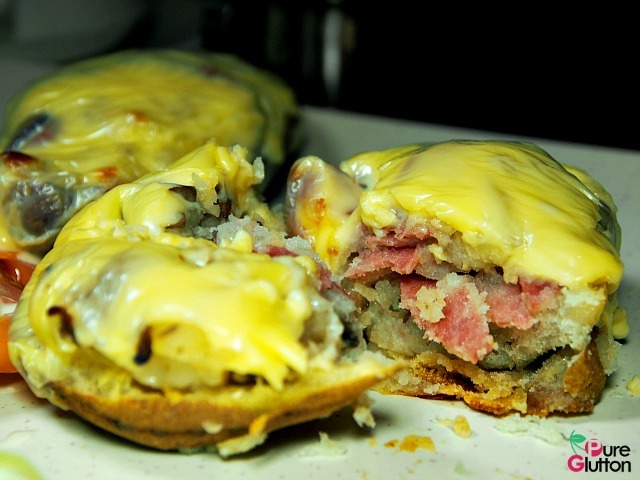 I glanced around and sure enough, quite a number of diners had ordered this! The pan-fried chicken thigh was well-seasoned and the honey mustard sauce drizzled on it gave it a sweetish and tart nuance, which I must say, went very well with the chicken. I like sausages and their Grilled Jumbo Sausages, either chicken or beef (RM16.80) while not spectacular, were adequately tasty. 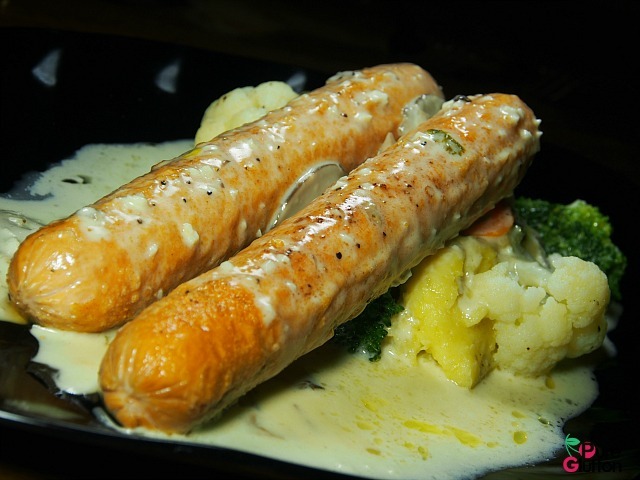 I didn’t quite care for the watery cream sauce (perhaps a poor rendition of Bechamel sauce? ), the sausages tasted fine on their own. 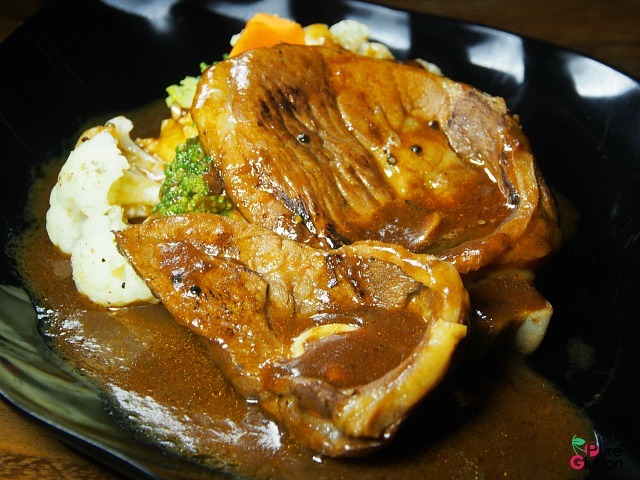 The grilled mains of Lamb and Ribeye Steak (both at RM22.80) were also popular. They may not be the best meats I’ve had but at those prices, the lamb and steak served with mashed potato and boiled vegetables were pretty good value. 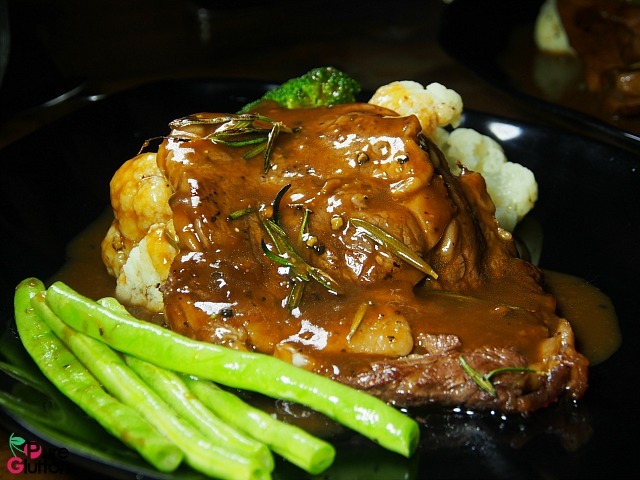 The only grouse was that the sauce could be improved. So… aspiring musicians/singers are encouraged to contact the good people in Unplugged Music Cafe to set up an audition session and if they think your music is of performance grade, the stage is all yours to perform at pre-agreed scheduled slots. Kudos to the Leong Brothers for encouraging aspiring talents to showcase their abilities using their fully-equipped stage as a stepping stone to greater stuff.